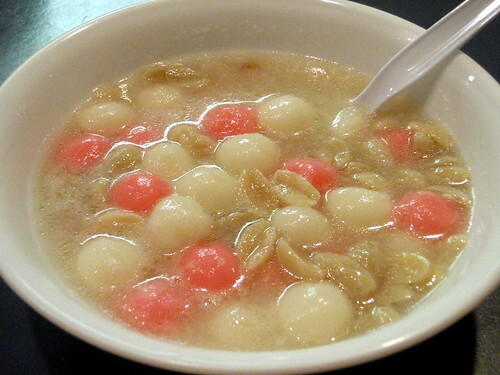 Tang yuan, or sweet glutinous rice balls, are traditionally eaten during the winter solstice. It's a little late for that, but they're so easy and fun to make and perfect all winter long as a warm, sweet ending to a Chinese meal. Plus, they're so cute to photograph! It's like edible Hello Kitty! In a medium mixing bowl, add 1/2 cup of water to the rice flour and mix well. Continue adding more water until the dough is the consistency of Play-Doh. It should feel slightly wet and cooling to the touch, but neither runny nor crumbly. Set aside 1/3 of the dough and cover so it doesn't dry out. With the other 2/3 of dough, take a handful at a time and roll into a long snake, covering the remaining dough. Pinch off centimeter long pieces and place on a plate, being careful not to let them touch each other. Roll each piece with both hands into a ball and set back on the plate. You can roll 2 or 3 at a time this way. Continue until all the white dough is used up. Add 4 drops of red food coloring to the remaining 1/3 dough. Knead until the color is homogeneous. Roll, pinch, and shape into balls as above. If you are not going to cook them right away, cover the plates with plastic wrap and set in the freezer until the balls are hardened. Then you can transfer them to freezer bags. If they are stuck to the plate, heat the bottom of the plate over low heat until they can be removed easily but make sure they don't get warm enough to melt. To cook, boil water in a medium pot. Start boiling another pot or tea kettle of water. Add the rice balls to the first pot and cook until they have been floating for a minute or two. Transfer with a slotted spoon to serving bowls. Add the boiling water from the second pot or tea kettle and add sugar to taste. 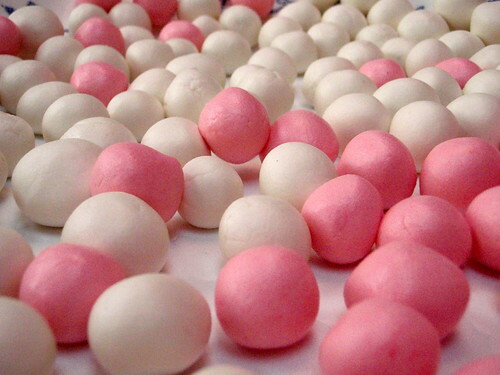 You can also try filling the balls with sweet sesame paste, red bean paste, or peanut butter. And for extra bonus points, you could fill it with lotus paste, roll it in sesame seeds, and deep fry them to make those awesome sesame balls you can get at Cantonese dim sum. hahaha! guess how i found you? i thought the picture looked similar to one I had seen elsewhere and sure enough...the name matched. :) Great post! I love these with peanut butter! Mmmm, delicious! Hope you don't mind if I add you to my links! very cute! reminds me of mochi!